Usher in a prosperous and abundant Year of the Earth Boar with sumptuous delicacies and specialty menus from award-winning Jiang-Nan Chun, specially crafted for family or business festive feasting at Four Seasons Hotel Singapore. Expect exquisite dining in sophisticated ambience made even more special with celebratory menus crafted by Executive Chinese Chef Tim Lam. Festive menus that spotlight fresh, seasonal produce are available at SGD 148, SGD 178 and SGD 228 per person for six courses, and range from SGD 1088 per table of either persons to SGD 5,688 per table of ten persons for eight courses. Toss to prosperity and abundance with fresh Australian lobster and abalone yu sheng, spotlighting the natural textures and flavours of daily sourced lobster and abalone, complemented by hand-shredded seasonal vegetables and homemade condiments and sauces. Augment the lo hei with fresh, raw salmon slices. Also available is six-course vegetarian set menu at SGD 118 per person and other specials including wok-fried Boston lobster in black bean sauce and braised six-head abalone with dried oyster and black moss. Celebrate in style with sumptuous menus set against a backdrop of luxury in the Hotel’s elegant ballrooms. With a promise of personalised and dedicated service, the Hotel’s experienced catering team will take care of the smallest details for a memorable experience. Seven-course set lunch menus start from SGD 988 per table of ten persons, and eight-course set dinner menus start from SGD 1208 per table of ten persons. Guests also have the option of individually plated seven-course set menus from SGD 123.80 per person for lunch and from SGD 130.80 per person for dinner. Jiang-Nan Chun presents a range of sweet and savoury Lunar New Year delights, perfect for family celebrations or festive gifting. 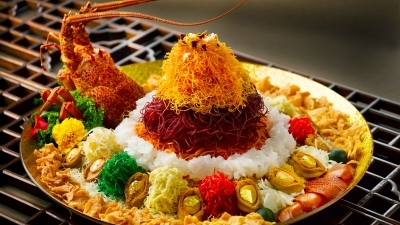 Toss to good fortune with the restaurant’s signature yu sheng, a bestseller that comprises an appetising mix of interesting ingredients including smoked salmon slices, crispy vermicelli, fried sweet potato strips, preserved papaya, beetroot and shredded radish, complemented with a homemade dressing of plum sauce and pineapple paste. Additional accompaniment options include three-head quality abalone (SGD 64 nett per order), bird’s nest (SGD 60 nett per order), Japanese surf clams (SGD 30 nett per order), smoked salmon (SGD 28 nett per order), crispy fish skin (SGD 18 nett per order), crispy silver fish (SGD 18 nett per order) and crackers (SGD 6 nett per order).